The new regulations stipulates the exhaust positioning in the precise manner in which F1's technical regulations are usually laid out. The regulations declare the exhaust must exit 170-185mm behind the rear axle line and 350-500mm above the floor. Given that the regulations also dictate that the end of the tailpipe has to point upwards, it means that cars cannot gain any aerodynamic benefits from the exhaust. 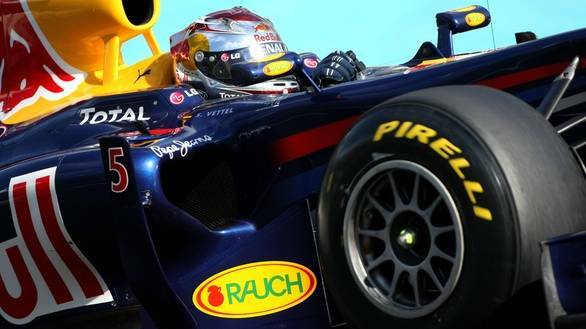 Remember when you first caught sight of the 'stepped' nose at the beginning of the 2011 season? Well, if you were hoping that the FIA had reneged, they haven't. After all, the changes that were made in lowering the nose cone were purely driven by the motive of making cars safer. This, especially after Mark Webber's Red Bull nearly took off like a rocket ship at the 2010 European Grand Prix at Valencia. Well, the FIA has lowered the nose tip to 550mm now, and has allowed the teams the option of a vanity panel in order to mask the 'step' between the nose and chassis. What's the upside of the Pirelli exploding tyre saga? Well, the FIA has now decided to add a clause to the regulations that allow for tyre specifications to be changed pronto should the need arise. The new regulations also state that energy recovery systems will now play a greater role in supplying power to the cars. This is achieved by ERS-K, similar to the current Kinetic Energy Recovery System (KERS), only a lot more powerful. While KERS allowed cars to access a power figure of 80bhp that now increases to 160bhp. While this power is currently available for 6.67s per lap, it will now be available for five times longer. Given that the weight of the powertrains has now increased, overall weight of each F1 car now increases from 642kg to 690kg. In order to further increase safety, the FIA and teams have come up with a side impact structure that is likely to resist side impact. However, these impact structures will not be rigid, allowing the teams some amount of freedom when it comes to design for their individual cars. We'll keep you posted on more of these regulation updates and changes as and when they come up.